Inaugurated in 2013, the Hawaii Ukulele Museum Benefit Concert is part of the Ukulele Picnic Weekend, the largest annual ukulele festival in Hawaii and is a benefit for a planned Hawaii Ukulele Museum to be constructed at Kaka’ako section in Honolulu. The inauguration concert in 2013 was held with a star-studded lineup of entertainers from Japan and Hawaii, headlined by BEGIN, a popular group from Okinawa. Also performing were Raiatea Helm, John Cruz, Ho’okena, Benny Chong, Byron Yasui and the Ukulele Orchestra from Japan. The concert has continued for every year since inviting a number of celebrity musicians locally and internationally. All funds raised from the event will benefit the Ukulele Museum construction. The Ukulele Foundation of Hawai’i is a non profit organization (501 (c)3 public charity) whose primary objective is to support music in education, as well as various charities and arts throughout Hawai’i, Japan and throughout the world through collective interest and awareness of the ukulele. The mission of the Ukulele Foundation of Hawai’i is to establish an ukulele museum that will facilitate social, educational and cultural activities in a friendly environment that perpetuates happiness and joy of the ukulele. 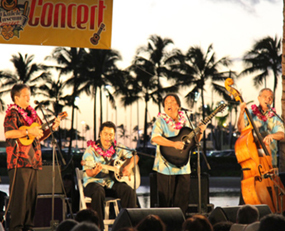 On Feb. 9, 2013, the inaugural concert took place on the Great Lawn of the Hilton Hawaiian Village from 5:30-9 p.m., with a star-studded lineup of entertainers, headlined by BEGIN, Raiatea Helm, John Cruz, Ho’okena, Benny Chong, Byron Yasui and the Ukulele Orchestra from Japan. An xclusive silent auction was also held throughout the entire evening. The 2nd Annual Hawaii Ukulele Museum Benefit Concert 2014 was hosted on May 23rd (Fri), 2014 featuring Don Tiki, Raiatea Helm, Bryan Tolentino, Benny Chong, Byron Yasui, Aidan James at the Hawaii Prince Hotel Waikiki Mauna kea Ballroom. Rare and valuable ukuleles from aNueNue, Kanilea and more at our exclusive silent auction was hosted during the 3 hour event. The 3rd Annual Hawaii Ukulele Museum Benefit Concert 2015 was hosted in February 9th (Sun), at The Willows Restaurant Honolulu with a five-time Na Hoku award winner WAIPUNA. Also featured Kalei Gamiao. In 2016, the concert at its 4th year will be hosted at the Hawaii Prince Hotel Mauna Kea Ballroom on February 12th (Friday), 2016 and planned to invite several icons of ukulele and Hawaiian music to perform on stage as well as hosting an exclusive silent auction to help raise funds.